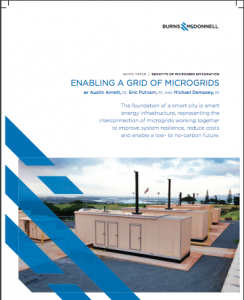 Fundamentally, microgrids provide energy reliability for critical operations. Military installations and hospitals, for example, don’t have the option of shutting down if the power goes out. Therefore, for decades they have mitigated this with on-site backup generation capability. However, continuously improving technologies and unit cost reductions are enabling facility owners to install new or evolve existing backup power assets into integrated microgrids that provide more than just backup power. And smart energy infrastructure is helping enable the proliferation of microgrids. Today’s microgrids provide owners greater control over their energy use through energy storage, self-generation (e.g., renewables and backup power generators) and load shedding. For manufacturing and industrial facilities, microgrids can be key pieces in corporate social responsibility and/or sustainability programs. While each is primarily designed to enable stand-alone power islands, microgrids can be made even more valuable through the integration of these assets into a grid of microgrids to provide increased stability and reliability for an entire community during disturbances or peak demand times. Download the new white paper from Burns & McDonnell that explores how energy infrastructure is enabling a grid of microgrids and changing the energy landscape.